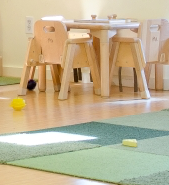 Lauren’s daughter Ava recently began attending preschool at University Synagogue. After touring many schools, Lauren is pleased with the selection they made and can already tell that it is a great fit for not only her daughter but for their whole family. As Ava now spends many hours a week in her classroom, Lauren has been looking for a way to get involved and give back. 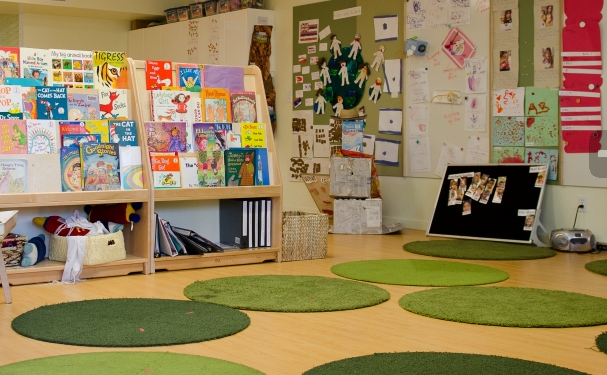 When she heard that the parent association was planning to redo the school library, she knew this was the perfect opportunity to offer her expertise. The school principal, April, has a very clear vision for the direction she wants to take the school design-wise, and has already implemented this overall look into the amazing outdoor classroom they built last year. 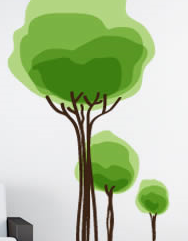 Lauren met with April to discuss this vision and couldn’t agree more that this organic and soothing atmosphere should be the direction the rest of the school goes as well. Lauren created this vision board to be presented to the school administrators to make sure they were all on the same page. April sent Lauren the link to the website for this school to show where she got her own inspiration. 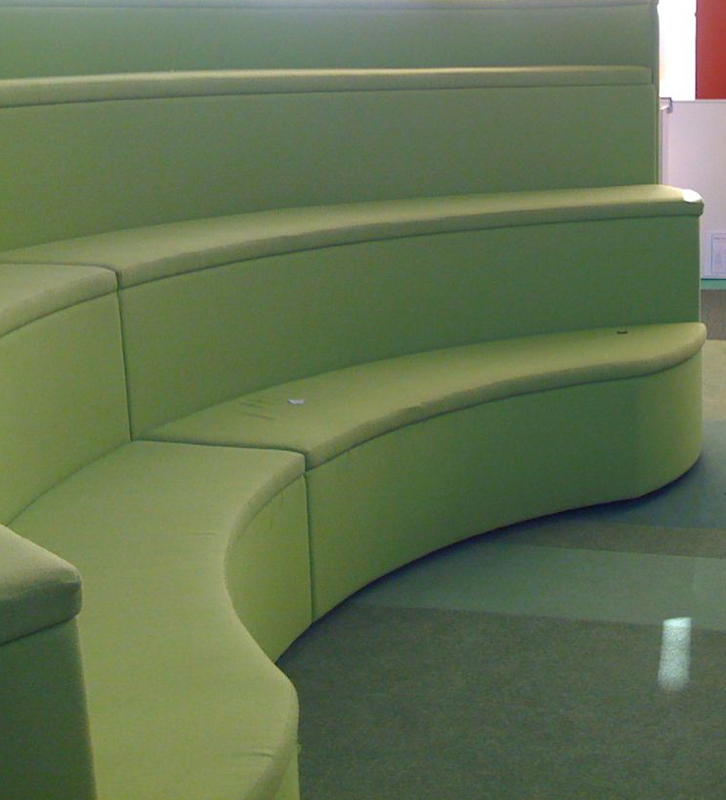 Her one request was to have some sort of tiered seating that is made to fit the space. In addition, they thought it could be fun to include some bean bags for the kids to sit on as well. Lauren found this rug image and thought it could be a great way to incorporate texture and interest into the space without compromising the color scheme. 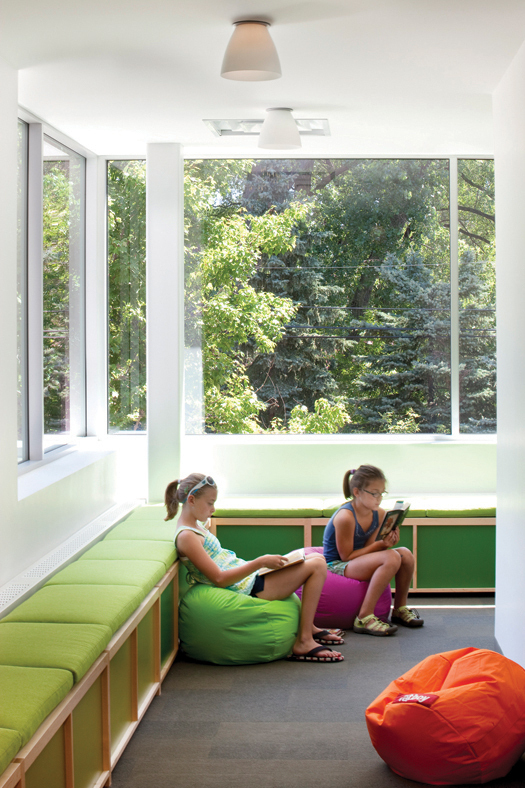 As you can see in the photos above (the middle photos in the vision board), the existing library lacks warmth and an inviting nature. The committee in charge of this project let Lauren know that that they were hoping to include some sort of mural and to paint the walls to give this space the warmth it deserves. She liked the look of this artwork as it follows the geometric feeling of the rest of the room but is also organic and interesting. Once the design was complete, Lauren had one more vision herself. She thought it would be fun to incorporate some sort of sculptural display to house specific seasonal and holiday related books. She is hoping she can add in this one last thing, but we will see. This fun and important project is already underway. The committee has been working away to organize all of the books and have created a system for keeping them organized in the future. They have also been working hard to clear out unused materials and toys and are coming up with a budget to complete this project. They know it will not be an easy task but with so many people lending a helping hand, this space will soon be beautiful! 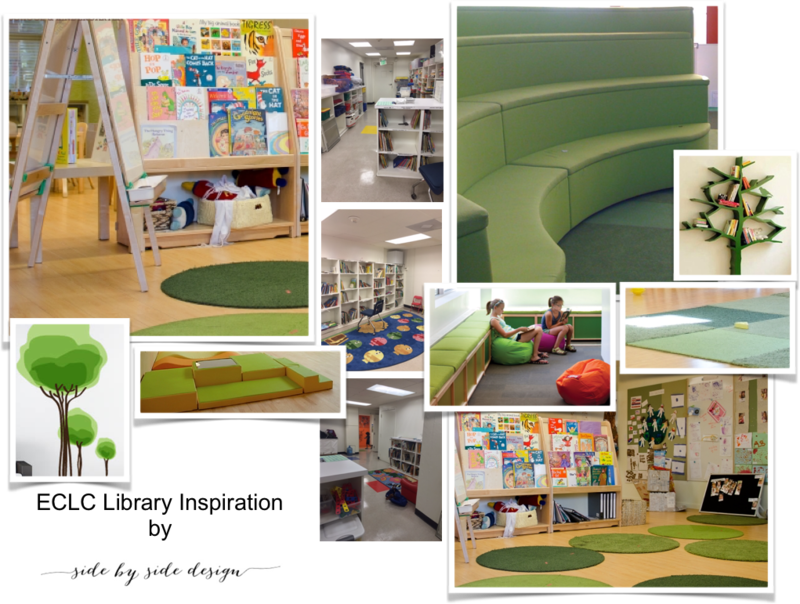 Lauren looks forward to seeing her own kids use this library in the future and knows that it is sure to bring a smile to many kids faces as they learn so many new things. Recently, a family member of ours mentioned that she wanted to plan a special surprise party for her husband. She sent out an invitation to all of their family and closest friends and asked us to help her to secure vendors and to plan the decor. When planning a party for a family member, we definitely feel like we have an advantage as we already know so much about what they like. For this particular cousin, we knew that he loves to be outside, a good tequila shot, and that he definitely deserved a special day that was all about him. 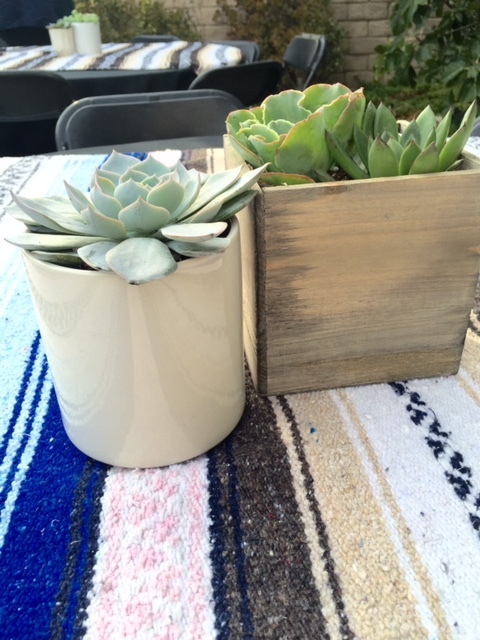 This is why we planned a masculine in color, Mexican inspired party. The next step (as with all surprise parties) was to plan a diversion. Since his wife planned to host his birthday party in their backyard, she needed to get him out of the house. So she asked one of his buddies to host an all day poker tournament. Simple, right? Haha, that’s what you think! Nothing is ever simple. Just five short days before the party was to take place, our cousin (the birthday boy’s wife) was rushed to the hospital for an emergency appendectomy. However, nothing stops this girl! She planned to throw the party anyway. She decided to not make it a surprise and told her husband so he could help a little around the house. She did keep a few secret details a surprise though. The birthday boy’s wife is a yoga instructor and happened to have many traditional Mexican blankets lying around the house (she uses them in her lessons). We selected the most masculine ones to use as our table overlays in a blue, green, gray, brown, white, and black color scheme. All other items (chairs and table linens) were black to keep things simple. We rented all of the tables, chairs, and linens from a local party rental supplier (AAA Rents and Events) as well as a large light fixture so that this outdoor party could go late into the night. Bright and early yesterday morning we headed out to one of our favorite spots, the Los Angeles Flower Mart. 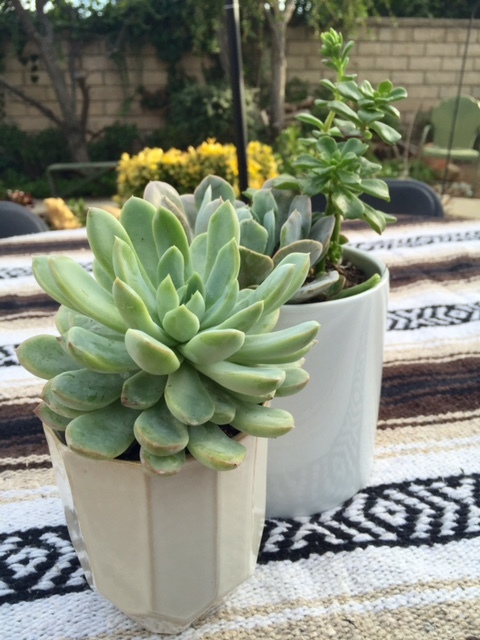 We gathered succulents in a variety of styles to create these potted plant arrangements. 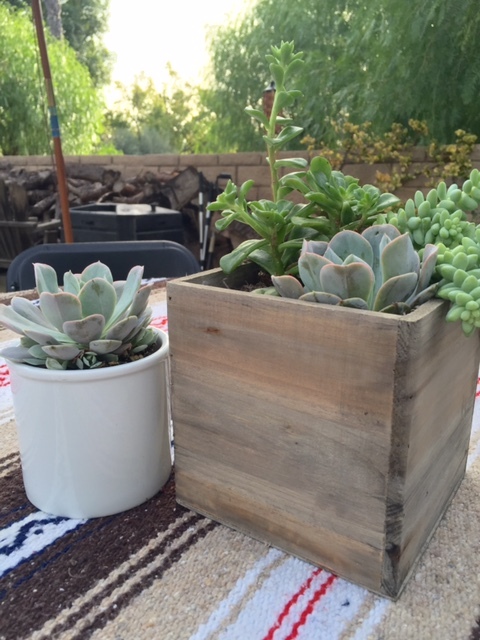 These rustic wooden boxes were found at our local floral supply store and were the perfect way to keep the decor outdoorsy and masculine. A variety of white pots were also used to keep each arrangement unique as well as our set of antique glass lanterns for a touch of party glam. How can you have a Mexican inspired party without a taco cart? 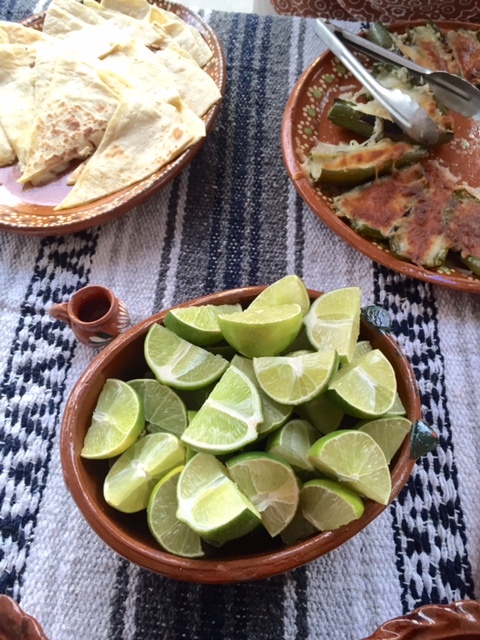 We secured (in our opinion) the best of the best Los Angeles has to offer in Mexican catering. For some reason, we have both been to many parties lately that have brought in taco carts. It makes sense, the weather has been warm so it is the perfect time to eat outside. Plus you can’t beat someone else doing the cooking, especially when it tastes authentic and amazing. Lauren happened to go to two parties with the same caterer, Taquizas Tecoman, and felt compelled to ask for their business card. She was seriously impressed! She promised Tami that she would not be disappointed, that the staff is extremely professional, and the prices very reasonable. It sounded like a no brainer. Lauren was right, and all of the party guests were beyond happy! 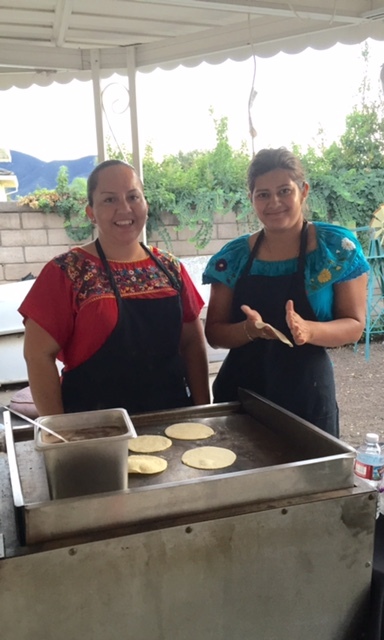 Everyone enjoyed what seemed to be a never-ending supply of quesadillas, traditional Mexican rice and frijoles, cheese stuffed peppers, and tacos of course. We are not sure what was better. The steak or the chicken? 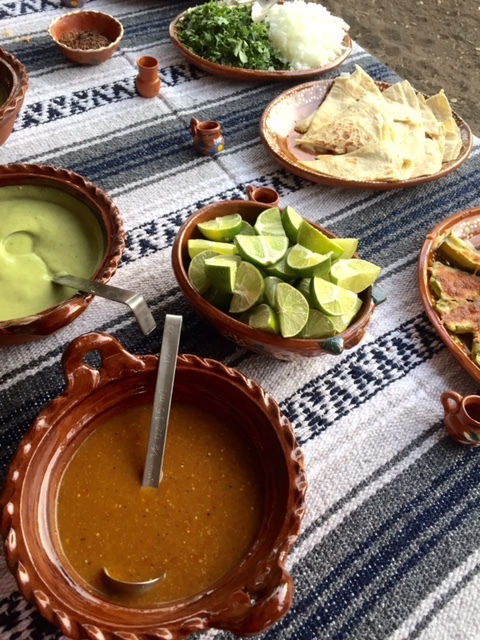 We do know however, that the tortillas were handmade right on location and that the homemade salsas, pico de gallo, and guacamole were to die for! 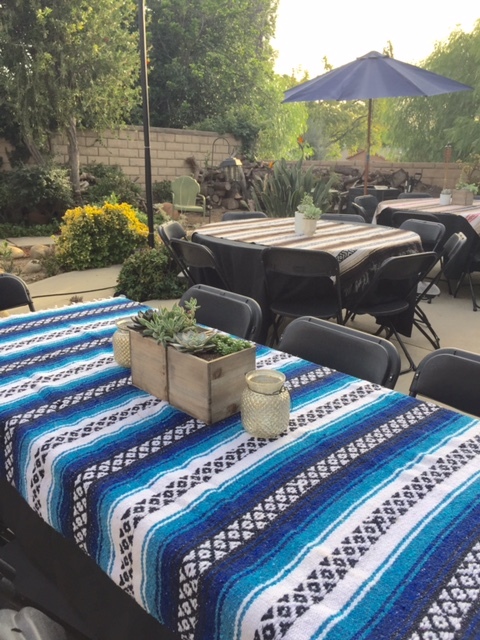 Guests enjoyed homemade margaritas and sangria, and we are pretty sure that the birthday boy’s friends toasted his health and happiness in the next year with his favorite … tequila. In the end, we feel so happy to have been a part of this special day. We know that the birthday boy may not have been surprised by the party, but was definitely not expecting friends to show up from all over the country to celebrate with him. We are grateful to our cousin for trusting us to pull off the decor and event planning (especially when she was recovering from surgery). Happy Birthday Gerald! May this year be filled with all of the health and happiness you deserve! #5: As seen in our post, Haunted Graveyard – A look back on the decor details from our very first year decorating the front yard of our now annual Halloween project. 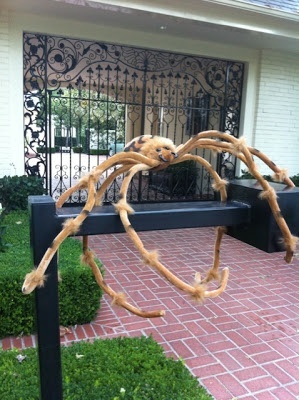 If you dared to visit this family’s home, you would first have to brave this large spider standing guard at their gate. #4: Also seen in our post, Haunted Graveyard – Each of the awesome characters we included that year moved and made noise. 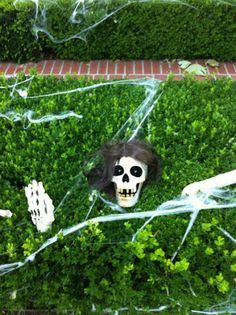 Imagine how scared you would be if you happened upon this skeleton hiding in the bush! #3: As seen in our post, Trick Your Treat – A fun DIY project we did for the kids in the neighborhood. 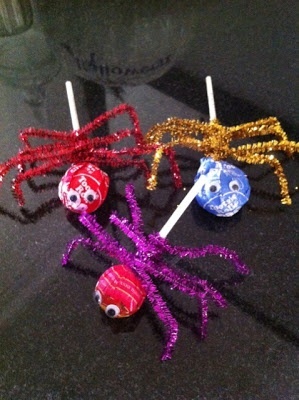 It was so much more fun for our Trick or Treaters to receive these spruced up treats on Halloween. Why not Trick Your Treats out too? It was super easy! 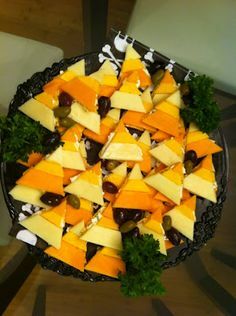 #2: As seen in our post, Craft Club Pumpkin Decorating – We made these adorable candy corn inspired cheese and crackers a few years ago to bring to our Craft Club meeting. They were so much fun and Pinterest inspired, of course! … and the #1 most pinned Halloween pic: Also from our post, Haunted Graveyard – This is ours and your favorite prop of all time! 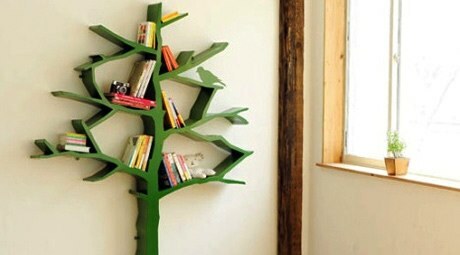 We got an overwhelming amount of love on Pinterest for this pic and you can see why. 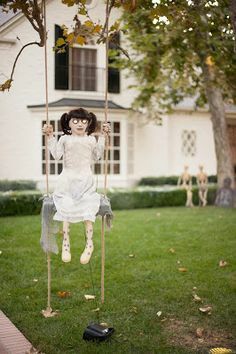 This zombie girl (who sings as she swings) is by far the scariest! A little while back (in our posts Transitional Edge Kitchen and Powder Bathroom), we shared some looks into a home project that is transitional yet edgy. This has truly been one of our favorite projects to work on as the client’s style is so on point with our own. She has impeccable taste, attention to detail, and appreciates the process of it all. She decided it was time to redo her daughters’ bedrooms and knew the amount each of them would want to be involved in the overall look. 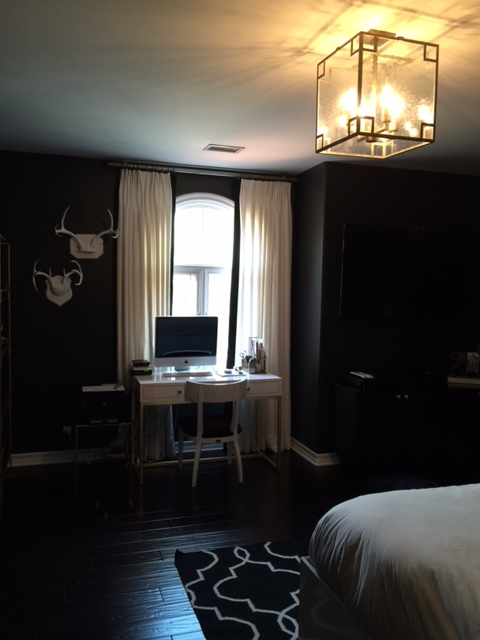 Her eldest daughter wanted a room that she would enjoy as she finishes high school and would be proud to come home to in a year when she leaves for college, but left the details up to us. The only piece of furniture we decided to keep in the room was this bed. The headboard, made of an old door, was cool and architectural and we knew everything else would work well with it. We painted the walls black so that it would stand out even more and added new bedding from Restoration Hardware to soften it up a bit. She also already had this fun rug, but we love the new details as well (including the nightstand from Sitting Pretty and the milk glass lamp from West Elm). We wanted to add some interest so we used this special wall treatment on some of the main walls. Can you believe our hand painter created this look with just a stencil and a paintbrush? She also already had this vintage dress form which we knew would look amazing in her new space. The light fixture, custom made by Gali Art, adds another fun architectural detail, and we love how the custom draperies turned out (very sleek and tailored). The desk, dresser, etagere (also purchased from Sitting Pretty), and the desk chair from In Mode Home, are all interesting in their own right but do not look like a traditional set that you would expect. 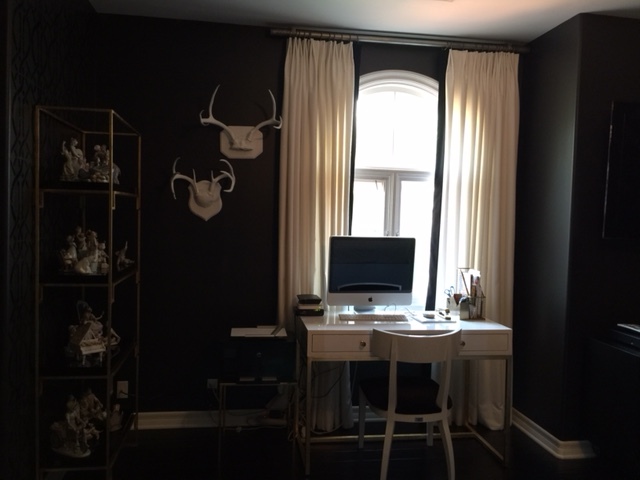 We decided to hang her existing antlers on this wall so that you see them when you first walk into the room and had them touched up with white paint for a fresh look. Here is a close up of the wall treatment so that you can see how flawless it truly is (More from this talented artist to come in our blog soon …)! 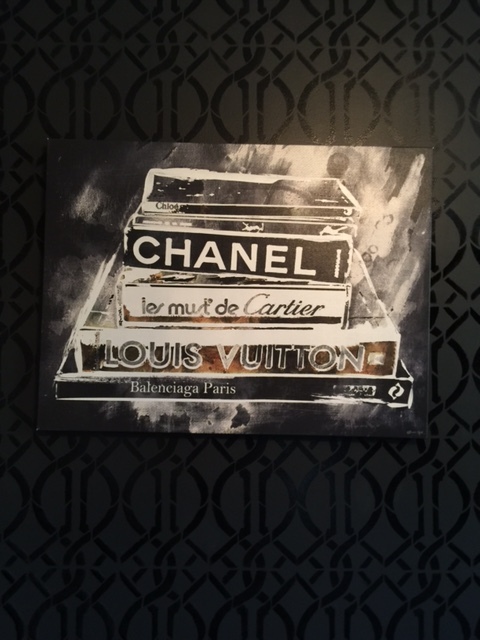 We picked out this fun piece of art from Z Gallerie to finish off the entry wall. 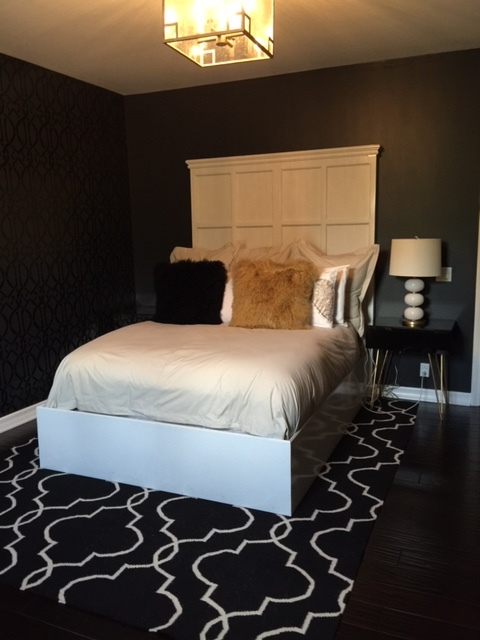 We absolutely love how this teen bedroom turned out. It is sophisticated, fun, and definitely edgy! We are in the process of finishing her sister’s room and can’t wait to share that with you as well. In addition, several of the other main rooms in the house are almost completed, and we are on the edge of our seats with excitement to unveil how magnificent they turned out … stay tuned! When we get the opportunity to collaborate with a truly talented team of individuals, we always jump at the chance. 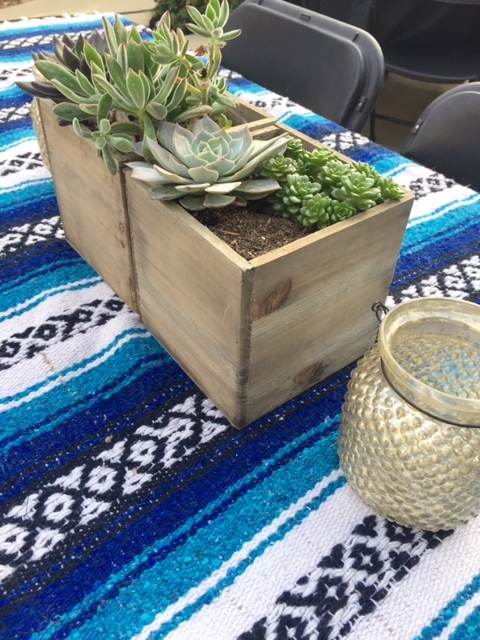 Each and every event vendor we have worked with in these types of collaborations adds something into the mix that is unique and special (whether it be innovative ideas, beautiful floral arrangements, or even catered delicacies). This Thanksgiving, we have arranged a collaboration with two of our favorite vendors (Cielo Catering and Events and House of Magnolias) to make this holiday extra special for anyone who is interested. We are so excited to be bringing our team’s vision to life. We are offering a full service holiday experience complete with custom table design to fit the look of our clients’ homes, table set up and take down, floral centerpieces by House of Magnolias, and a catered dinner or luncheon by Cielo Catering and Events. Each package can be customized per our clients’ needs from a la carte services off this list to a full package with everything included. 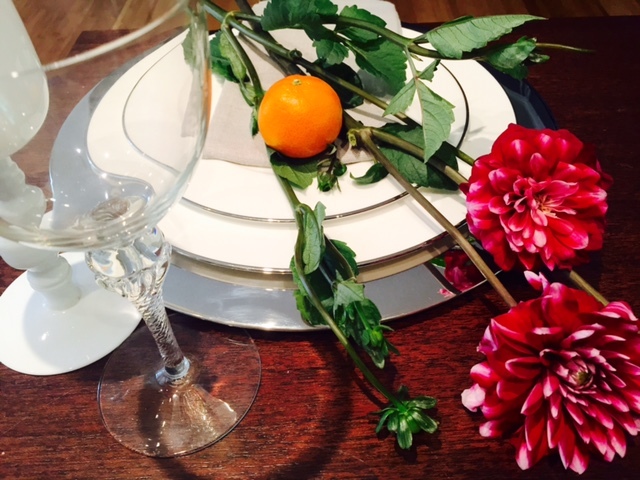 We can also use clients’ own dishes, silverware, and linens, or rent these items as needed. Our goal is to assist in bringing the essence of our clients’ homes into their Thanksgiving experience, to ensure that their holiday looks and runs seamlessly, and they are able to sit back and enjoy the day with the ones they love. We will take care of the details. Cielo Catering and Events has prepared a Thanksgiving menu that is unique but still includes all of the traditional aspects of a Thanksgiving meal. Our Pumpkin Pecan Cobbler Served with Vanilla Ice Cream, Simply Delicious! Doesn’t this sound fabulous? Kayla of House of Magnolias will create a Fall inspired centerpiece to fit our overall concept for this event, giving each client a Thanksgiving experience that is unique for their family and friends. We thought it would be fun to offer this service to our readers as well. For more information on any of the above services please contact us at info@sbsdesignla.com or call Tami Bitton, our Event Coordinator, at (480) 628-8264.